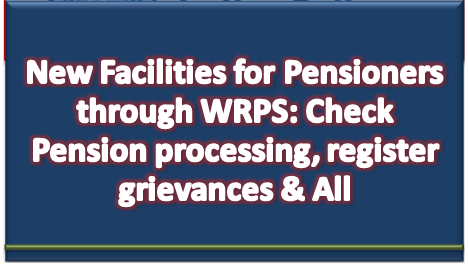 Facilities for Pensioners through 'Web Responsive Pensioners Service' (WRPS): Check Pension processing, last 12 months pension, register grievances etc. Quick disposal of grievances of pensioners has been a top priority of CPAO. For this purpose, a Grievance Cell is already functioning in CPAO and grievances received through different modes are settled by it. So far, grievances not pertaining to CPAO directly but involving other agencies are being forwarded for final disposal to the concerned agencies i.e. Bank and PAO for necessary action. 1. View and Download the Special Seal Authorities issued by CPAO in both fresh as well as revision pension cases. 4. Register grievances and check the status etc. To facilitate pensioners, a step-by-step user guide along with relevant screenshots is attached for ready reference. The same may be given wide publicity for the benefit of the existing.pensioners as well as future retirees. In case of any technical difficulty in using this facility NIC Cell may be contacted at e-mail ID it.support@gov.in and for any other query related to pension, Grievance Cell may be contacted on Phone No. 011-2671511 and at e-mail ID cccpao@nic.in.